We had to catch this ‘after’ picture in early spring – in summer the building almost disappears behind the greenery. Back in 1928 it was a brand new building built by Dominion Construction (the contractors led by Charles Bentall). The client was H H Stevens, a successful politician and businessman. Herbert Henry Stevens was born in Bristol, England, but arrived in Ontario with his family in 1887 at the age of nine. He made his way to the West Coast, working as a mine laborer and eventually became a small businessman. For a brief time in 1900, his travels took him to the newly annexed Philippines as part of a U.S. Army transport unit. He was also in the Pacific at the time of the Boxer Rebellion and participated as a volunteer civilian member of the U.S. Army in China. These experiences can be associated with a number of Steven’s future positions; a confirmation of his Methodist teetotal background, (and active opposition to the availability of alcohol), support for organized labour (despite a staunchly Conservative political opinion on almost everything else) and a strong belief in the fundamental difference between western and Asian culture, which he believed should be removed from areas of western control (like Canada). In 1901 he established a grocery business, and in 1910 the newspaper ‘The Western Call’ that supported Conservative views and included significant coverage of ‘the Chinatown problem’. Stevens never moderated his views on preventing any further incursions into the superior white world he imagined Canada should be. He was elected to Vancouver City Council in 1910, and then as a Conservative member of parliament, In 1911, in his maiden speech he called on the government to keep Canada “a white man’s country”. During the Great War he ensured that the ‘official photographers’ in Stanley Park, Fricke and Schenck, lost that contract because of their German lineage. In a 1922 speech he argued for exclusion of all Chinese, posing the question “shall Canada remain white, or shall Canada become multi-coloured?”. It’s unlikely he’d be particularly happy in Vancouver today. Stevens was Minister of Trade and Commerce in R.B. Bennett’s depression era Conservative government of 1930 to 1934, and was actively involved in the Komagata Maru incident, working with the head immigration officer to stop the ship’s Indian passengers from coming ashore. Stevens undoubtedly chose Dominion Construction to undertake his investment because Charles Bentall was a staunch member of the Methodist church, and Dominion had in-house architects who could design their projects, acting as design-and-build contractors. More recently it was restored by designed Robert Ledingham when it became a 25 unit strata, and has a period lobby, carpets and lighting fixtures, with what is claimed to be the city’s last brass-gated bird cage elevator. We identified a building in a previous post as probably being Thomas Hooper’s building for grocer and meat and game dealer R V Winch. We thought that this photograph showed the same building, although we weren’t certain (although the street numbering and the insurance map from 1901 suggested they might be the same). Clearly this is R V Winch’s store, photographed in 1890 and in the Vancouver Public Library collection. (They have another version of the same picture dated as 1888, but that date is less likely to be accurate). We’ve charted Mr. Winch’s progress in the city on another blog, because he ended up building one of the finest buildings in the city’s early history. His first store was on the same block as this, but further east, at 20 Cordova Street. That was redeveloped as part of the Dunn-Miller block now occupied by the Army & Navy store, and Mr. Winch moved to this new property a bit further west in 1889 – initially numbered as 52, although by the time this picture was taken in 1890 it appears to have become number 66. We couldn’t find any directory records that show him in any building address numbered as 66, it was either 52 or 58 Cordova, but then we noticed way off in the background of our previous post (photographed in 1893) that this building could be seen, just past the wooden hotel buildings that were replaced in 1909 by the Hotel Manitoba. In 1889 the Vancouver Daily World identified the location of a development by Mr. Winch’s as a 44 foot wide building ‘just to the east of Dougall House‘ which was on the end of the block, several lots to the right in this picture. As this is a 25’ building, we now think Mr. Winch built that investment further down the block, but kept his store here. R V Winch initially had a business partner – Joseph Shupe – but that partnership dissolved quite quickly. A few years later in 1894 he had another partner, his brother-in-law G E Bower, who was from the same town, Cobourg Ontario, and who started out as a salesman with company in 1892. He was no longer associated with the Winch businesses by 1903, and a few years later built one of a number of investment properties. By 1902 the Winch store had moved to the Flack Block on Hastings Street, and a few years later a new building went up on Pender Street. Richard Winch took a gamble on shipping canned salmon to England, was successful in the hugely profitable enterprise, and on the strength of his expanding business empire became wealthy enough to acquire a Rolls Royce and built the Winch Block, now part of the Sinclair Centre. We’ve see a number of these buildings (or their store fronts) in several recent posts. The building to the left is 36 West Cordova, and today it’s part of the Army and Navy store, but it started life as the Hayes & McIntosh block – a butchers store founded around 1889. 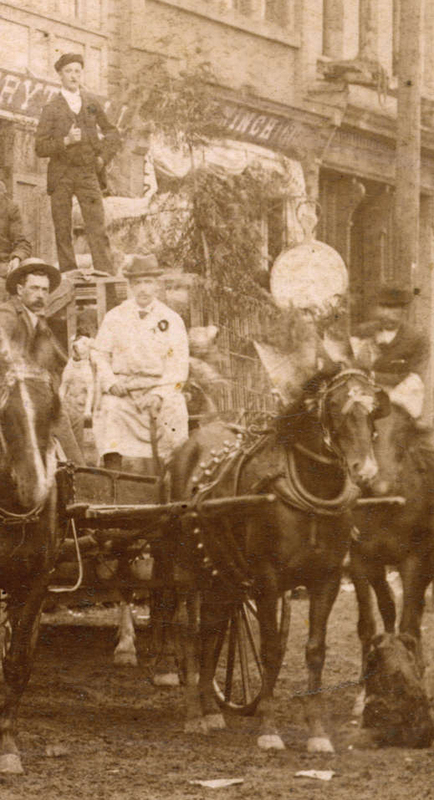 The entire staff and the delivery horses from the company feature in this 1893 image. Next door were a series of buildings that were undoubtedly built very quickly after the fire (probably by 1887, when 56 Cordova was home to the Central Hotel) The hotel was run in 1887 by Thomas Quann, and he continued to run it through to 1892 when the number was switched to 42 Cordova. We know it’s still this building because Hayes and McIntosh are shown in the street directory being located next door, although in 1892 he was listed as Thomas Quamm. His census entry identifies him as Quann, born in New Brunswick and aged 46 in 1891 with his Irish wife, Mary, and his children, 18 year old twins, William and Mamie, and John Henry who was 16, all of whom had been born in the US. There were at least 25 lodgers, showing that the Central had a significant number of longer term residents, most of whom seem to be working in construction trades, or as miners. They were a mixture of Irish, English, American with one from Wales, two from Quebec and two from Scotland. By 1896 the owners were listed as Quann brothers, with Thomas joined by WH and JH – presumably his sons William (Billy) and John (Jack) who had now taken over running the hotel. They went on to build the Rainier Hotel in 1905 on the site of their wooden Balmoral Hotel (which started life in 1886 as the Burrard House, run by John Burrard) as well as running the Rose Theatre, the Maple Leaf theatre, and at one point also the St Francis Hotel. In 1898 Powers and Farron had taken over running the hotel – James Farron who lived on Melville Street and Thomas Powers who lived at the hotel. They only stayed a year or two; in 1900 Newland and Farron were listed, and in 1901 Arthur Newland on his own. Arthur was English, aged 44, living with his Australian wife, Teresa, (who was 30), and they had just 3 lodgers. A year later the premises were empty, and in 1902 it became the Electric Theatre. This was Canada’s first permanent cinema – before this they were travelling shows run by people like the Electric’s founder, John Schuberg. The Electric cost 10c to get in – and seats were free. There was an usher to see that Ladies got the most Desirable Seats. Schuberg sold the Electric and moved to Winnipeg in 1903. In 1909 the site was developed with a new hotel, the Hotel Manitoba, run initially by the Quann brothers (although Jack Quann died in 1911, and Billy Quann a year later.. It retained this name until 1954, when it became the Hildon Hotel, the name it still operates under today (as single room occupancy accommodation these days). The ‘official’ heritage statement says it was designed by W T Whiteway. We cannot find a single reference to substantiate that attribution. The design, using white glazed bricks is much more reminiscent of Parr and Fee, who used the material extensively on hotel buildings at this time, especially on Granville Street. There are two building permits for Parr and Fee for this address, both in 1909. The first was in April, for Evans, Coleman & Evans, Ltd who commissioned $25,000 of alterations to the William Block. Two months later another $7,000 permit for the same address, with the same architects for further alterations was approved. Both projects were built by Baynes & Horie. The expenditure suggests something substantial in the way of alteration, but perhaps there’s a part of the structure that pre-dates the 1909 construction. Today there’s a 25 foot wide gap in the street that had a modest 2-storey building that in this image is occupied by R V Winch who sold fruit and meat, having moved from further east on the block when his previous premises were redeveloped for the Dunn-Miller block. This would suggest the building he is in was built in 1888, but we haven’t successfully pinned down a develop or architect – it’s possible that Mr. Winch developed it himself. Further down the street are two buildings that we think date back to 1899 – one developed by F A Boehlofsky and designed by Allan McCartney, and the second right on the edge of the picture that we think is R V Winch’s investment designed by Thomas Hooper. Today the Hildon Hotel – built as the Hotel Manitoba is here; built in 1909 – we think by Evans, Coleman and Evans (Percy Evans George Coleman and Ernest Evans) who had extensive merchant interests from docks to steamships with side interests in property (including two hotels on Cordova Street). Beyond is a 2012 residential building designed by Henriquez Partners for Westbank. In 1889 the Vancouver Daily World reported that “Messrs. Callister and Hayes & McIntosh are about to erect fine brick stores on Cordova Street, between Abbott and Carrall”. The two buildings were side by side, next to N S Hoffar’s Dunn – Miller block, (which we’ve seen in earlier posts). Today the façade of both buildings are still standing, incorporated as part of the Cordova frontage of the Army & Navy store rebuilt in 1970. (Deliveries to the store come off the street, rather than the lane as is more usual in the city). Callister’s acquisition of the site appeared in February 1890, and Hayes & McIntosh had already built their premises, so although the building description says it was built in 1890, it might be a year or so earlier. The sepia image above is dated from 1891, while below is said to be taken in 1898. Hayes & McIntosh had been in business for several years – here’s their 1887 advertisement. They traded as the Mainland Market, both retail and wholesale. On the earlier image the name over the store advertises G A Roedde, a bookbinder who was born in Germany, worked his way from Cleveland to San Francisco to Victoria, and eventually settled in Vancouver in 1888. He started work at the News Advertiser, was briefly based here, and then in 1892 moved to premises on Cambie Street. In 1891 George Hayes was living in lodgings, aged 46, born in the USA and described in the census as a cattle dealer. His partner, William McIntosh was younger – just 31 – and born in Ontario to a family with Scottish origins. He lived with his five younger sisters, Margaret (who had also been born in Ontario) and Maud, Grace, Fanny and Gertrude who were all born in the USA. He was described as a cattle dealer and butcher, and the entire family (including a five-year-old grandson, Robin Arnott) lived with their 62 year-old mother, Charlotte, who was described as ‘Capitalist’ as her occupation. We can find the family in an earlier census, from 1880. That year they were living in Boca, Nevada, California, United States, and Charlotte’s husband is around; Adrian McIntosh. William has an older sister, Mary, and another a little younger, Ella, as well as Maggie, Maud, Gertrude, Grace and Fannie. The US census had more detail, so we know the family had moved around. Maud was age 10, and born in Ohio. Gertrude and Grace, eight-year-old twins were born in Indiana, and Fannie who was five, once again in Ohio. In the 1901 census Charlotte McIntosh and two of her daughters were still living together – Grace was a teacher at the Central School – with her grandson Robin, but William wasn’t listed although he was shown in the street directory for that year living on Pender Street, and his company is still listed, although ominously described as “(in liq)”, which we assume means the company was bankrupt which would probably explain why it changed hands around this date. The Pender reference is wrong; it should have been Pendrell. We don’t know who designed the Hayes & McIntosh structure, although the window style is the sort favoured by N S Hoffar. Although it isn’t really his style, another possibility is that it was designed by C O Wickenden; the McIntosh and Wickenden families were next-door neighbours on Pendrell Street. Charlotte McIntosh died in 1902, and the McIntosh family seem to have left town. The meat store lived on, now run by P Burns – Patrick Burns the Ontario-born but Alberta-based meat mogul. Some histories will tell you that in 1907, Dominic Burns, a brother of Pat Burns, oversaw the construction of Burns Foods’ first slaughterhouse in the city, but actually that was in 1899 when he commissioned Francis Rattenbury to build new cold storage premises on Cordova Street, that we think were at the back of this building and built soon after the acquisition from William McIntosh. Rattenbury’s offices were for a while across the street in the Holland Block, and he is said to have designed Gustaf Roedde’s house in the West End. Dominic Burns commissioned the Vancouver Block on Granville Street (designed by Parr and Fee) in 1911, while Pat Burns in 1909 built a 6-storey warehouse on Hastings (now a rental housing building – the milk brick and window design suggests Parr and Fee might be the designers here too). We’ve struggled to identify the buildings, as they’ve been gone quite a while. However, we think we’ve pinned them down: on the left 58 and 60 West Cordova was a building that we think was designed by Allan McCartney as the architect of a block for F.A. Boehlofski. There’s an 1889 Vancouver Daily World notice announcing the project, located between Carrall and Abbott and in 1886 Boehlofski (or Boechlofsky as he was identified then) was a tenant at this address, with no owner being identified on the voter’s list that year. If we’re right that he was the developer, we’ve come across the owner before – he was running the International Restaurant here in 1889, the International Hotel in 1890 across the street and a block to the west, and in 1898 the Boulder restaurant, also across the street in the same block. Frederick Avon Boechlofsky was born in Hungary around 1835, and he was in the city before the fire. He had two daughters (who worked as waitresses in his restaurant) and two sons; all the children had been born in the US, the youngest in 1879. His daughter Ivy Freda married in 1889 at aged 19, and had been born in Marysville, California in 1870. Cecilia, born in 1873, married in 1899, and her birthplace was listed as San Francisco. In 1880 Frederick was in Portland, Oregon, working as a hotel cook (aged 41) with three daughters, all born in California, and two younger sons born in Oregon. His wife, Margaret, was shown as coming from Germany, although later Canadian census records showed Hungary. A third daughter, Hannah, married at least three times but her birthplace was never identified. Allan McCarney was born in the Bahamas, West Indies and travelled with his family to New York and Montreal before moving to British Columbia where he worked as an engineer at the Hastings Sawmill. We’re not sure whether he had any qualifications to design buildings, but he had completed quite a few before he died ‘a comparatively young man’ in 1901. Hugh Harvey ran the Harvey Boot Factory – a successful logging boot facility (competing with Leckies) at this location, after moving from the Dominion Hotel on Water Street in 1921. Mrs Peterson sold jewelery from the adjacent store, and upstairs were the offices of the Relief Project Worker’s Union. We thought the building next door, selling ‘Pride of the West’ overalls was built by pioneer trader Richard Winch in 1889, with Thomas Hooper supplying the design, perhaps his first commission for a commercial building in the city. We think that’s still quite possible; the 1889 newspaper description is for a 44 foot wide building, two storeys, just east of the Dougall House (which was on the corner). There’s a smaller building to the west of this one, next to the Dougall House, and that was built in the same year for Arthur Sullivan. Winch had a store slightly to the east of here in 1893, which made us initially think that was his development too – but it was only 25 feet wide, and not that close to the Dougall House. The overalls were made at a factory on Cambie Street from before the Great War, and E J Smardon was selling them in his men’s furnishing store in 1938, with the Pacific Rooms upstairs. Today there’s a new residential building designed by Henriquez Partners for Westbank, who built 96 low-cost home ownership units here in 2012 in a 10 storey building that also has 12 units of non-market housing over a retail base. Here’s another building on Franklin Street, an area that was once a rapidly developing Chinese-led area. It was Chinese-led in the sense that many of the developers in the area were Chinese, often with other business interests and premises in the traditionally understood Chinatown centred on East Pender Street. In part this was encouraged by the city authorities, who were keen to see the older Chinatown become less oriental. The earliest image we’ve dug out is from 1928, with a remarkable panorama of a funeral procession in 1928. 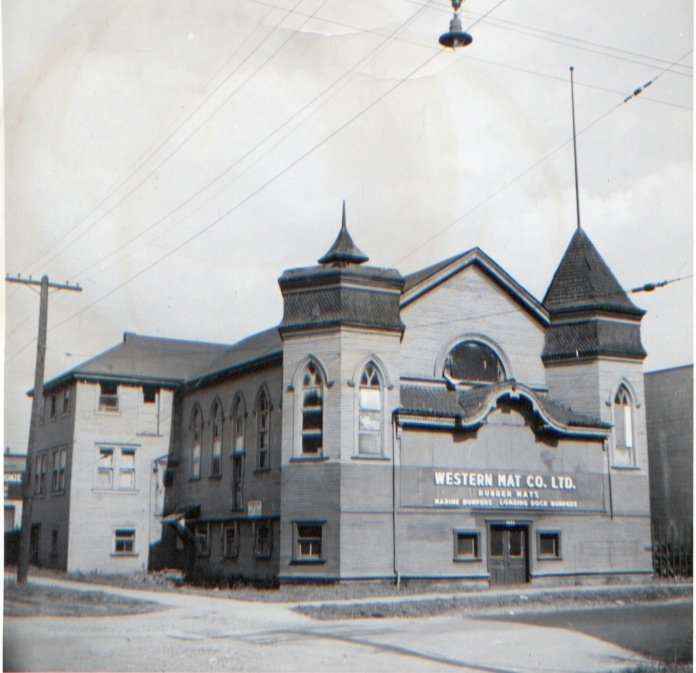 Our main photo identifies the building in 1956 as the Western Mat Co. Ltd., although the appearance suggests a different earlier history. It was built in 1910 at a cost of $15,000, the developer was recorded as S Sasaki, and the architect (and builder) was W H Archer. It was listed as a Frame Buddhist temple – we assume the frame refers to the structural aspect of the development. It was a Japanese Shin Buddhist temple: the first had been in a dining room in 1905, in 1906 it was moved to a refurbished home at 32 Alexander Street, and in 1911 the congregation moved to this building – the first purpose-built temple in the city. (There had been a number of earlier Chinese Buddhist temples in other buildings in Chinatown, but nothing purpose-built). the house on Alexander was sold, and became a Japanese language school. Mr. Archer’s design was fairly clearly quite western – it certainly isn’t immediately obvious that it’s a Buddhist building, although some elements aren’t typical of a Christian church – notably the porch. This may not have been accidental; the Shin Buddhist community referred to their buildings as churches which had pews and an organ; the priests were called Reverend, even the services became closer to Christian services with hymns. 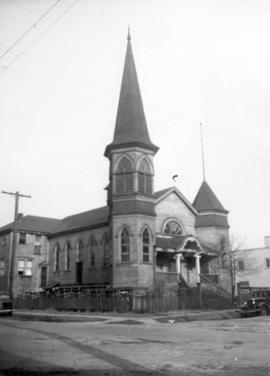 The 1940 image on the left shows that for many years the building had a steeple. Mr. Archer was originally from Ireland, and his church designs weren’t limited to Christian structures; he designed St Paul’s Anglican in the West End in 1905, and also the city’s first Sikh Temple in 1908, built in Kitsilano. Reverend Sasaki was from Fukui, near Kyoto, and arrived in the city with his wife in October in 1905, and two weeks after he arrived was giving a talk on the Buddha at City Hall. He raised the necessary funds from a congregation of over 650. The temple was built in an area known as ‘Heaps’ – named after Heap’s Mill at the foot of Victoria drive which employed large numbers of Japanese men. Having successfully developed the church, Rev Sasaki returned to Japan; for a while things went downhill from there. Reverend Kato Gungai was appointed, but questions about his financial ability led to him being replaced by Reverend Junichi Shigeno. As Terry Watada explains in a book on Canadian Buddhism, rather than return to Japan, Rev Kato remained in the city, spreading rumours about Rev Shgeno’s ‘libertine’ behavior. Eventually the church split, with a new congregation led by Shigeno on Jackson Street. After a while the two congregation reunited in 1925. The 1936 street directory identified the building as the Canadian Buddhist Mission, but by 1938, even before the internment of the Japanese community in 1941 the religious use of the building had been abandoned. Instead the Academy of Dramatic Arts were now in the building. In 1950 the Franklin Christian Spiritual Church were using the building, and when our main image was taken the Western Mat Co had moved in, who made rubber mats, marine and loading dock bumpers. They were still in the building in the early 1960s. We’re not sure exactly when the church was demolished, but by the end of the 1970s the site had been redeveloped as the automotive service centre that’s still there today. Image source: City of Vancouver Archives, taken by A L Yates CVA Ch P98.2, and PAN N144. Here’s another image from the City Engineers image vault in the City Archives that’s a companion to the previous post. It’s from the same junction, but in this case we’re looking west towards Downtown. Way off in the distance is the Vancouver Centre’s Scotia Tower with a tower crane still showing, so from that we can date the image to 1976 (or perhaps the end on 1975). We’re looking at a number of commercial properties in this industrially zoned area. When the first buildings were constructed here, just over a century ago, the area was on a very different trajectory. Chinese merchant developers built a series of buildings here, some of which still stand today. That’s true on the left of the picture where there are several buildings that date back to 1912 when Soon Key and Chin Yuen hired Stewart and White to design a two-storey $26,000 rooming house. They obviously decided to increase their investment quite soon, as a few months later Stewart White and Peters were hired to design an additional storey built at a cost of $8,000. The three storey building is still there today, a rooming house now known as Royal Manor, and extensively renovated in 1970. Soon Key and another partner added another building just round the corner of Woodland Drive a year later. Assuming Soon Key was also Soon Kee, his family portrait is part of the Vancouver Public Library collection. The Daily World described Mr. Soon’s evidence to the McKenzie King inquiry into the 1907 riot on behalf of Ti Sing Co, although the official record shows Tai Sing Ltd were at 19 Pender Street, which sustained $88 worth of damage in the riot. On the same day that the architects received permission to add the extra storey to the corner building, Stuart and White also sought a $26,000 permit for Mah Sam Yuen & Co for “Apartments/rooms; Chinese building, three-storey brick store & rooms”. Wood & Macdonald were the builders. 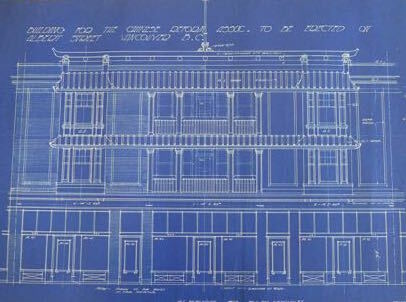 Sam Lum Mah was the builder of the third building, also given a permit on the same day for another Stuart & White design for the Chinese Reform Society’s $26,000 “Apartments/rooms; Chinese building, three-storey store & rooms”. The plans from the Vancouver Archives (AP 289) show an extraordinary composition of traditional Chinese forms married to an Edwardian building. The roof crest is of particular interest. Of all of the society buildings in Vancouver this was one of the most elaborate to be constructed – and it wasn’t in Chinatown. The Chinese Reform Society of the Americas (headquartered here) were the same as the Chinese Empire Reform Association, founded by Kang Yu-Wei, a philosopher and reformer who had to flee China in 1899 (ending up initially in Victoria). In Vancouver both Won Alexander Cumyow and Yip Sang were members. The organization was a rival to that of Sun Yat Sen, although funds for overthrowing the Manchu dynasty flowed from Vancouver to both groups of would-be revolutionaries. These last two buildings are still standing, but significantly altered: they are now in industrial use and seem to have been altered initially in 1940. 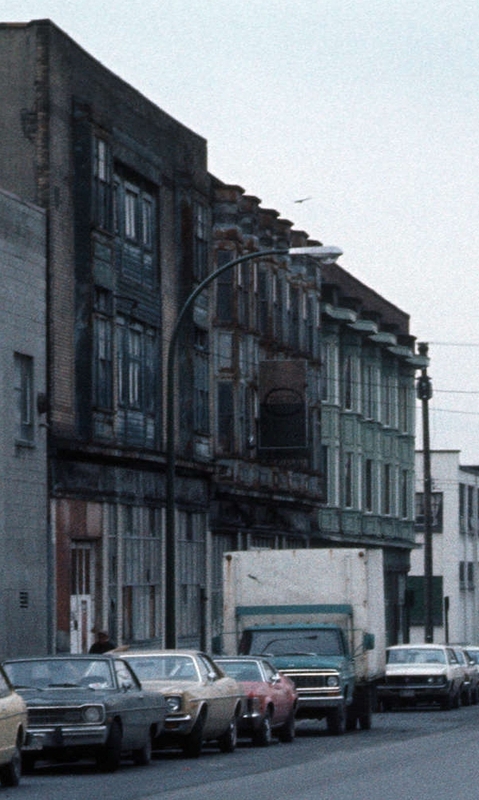 The 1970s image shows that almost all the Chinese detail had already been lost, and the metal paneled bay windows were in a pretty poor state, and these days they’ve all been removed. We found a little information about Mr. Mah, the developer; he was born in China around 1868, and in 1930 he was living in San Joaquin in California. Stuart was Bertram Stuart, a Londoner who was only in the city for a few years before heading to Seattle: White was Howard E White who seems to have arrived around 1910, and was probably the source of the commissions as he worked on a number of Chinatown projects for Chong Yuen as a partner in Cockrill & White. He continued to work in Vancouver after Mr. Stuart headed south. White was secretary of the local branch (#1) of Ordo Templi Orientis – a fraternal organization with elements of Freemasonry (although initiates could not have been Freemasons) but also other more esoteric rituals developed by British occultist Aleister Crowley.